What's it like to win (and drink) a year's supply of La Croix? Meet Claire McInerny, a Bloomington woman who won a year's supply of LaCroix sparkling water a couple of months ago. Claire is an education reporter for WFIU Public Radio and what you'd call a LaCroix superfan. We know what you're thinking: Aren't we all LaCroix superfans? You love LaCroix. We love LaCroix. 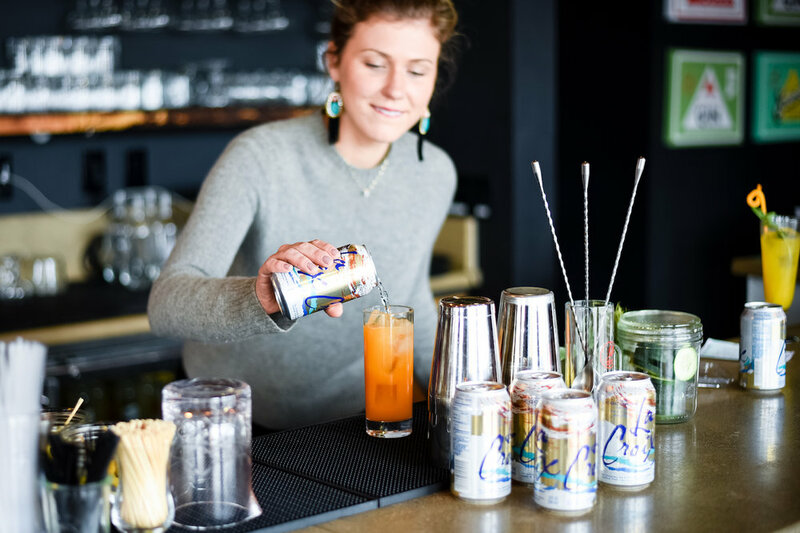 It's the calorie-free, sugar-free flavored sparkling water from the '80s that has roared back to life in the past few years, all the while rocking its pastel-brushstroke branding straight from the '80s. Everybody loves LaCroix. But not like Claire does. She has made her LaCroix crush known so many times on social media that when she announced on Facebook that she won a year's supply, her commenters responded as if they had witnessed someone's dream coming true. A selection of comments: "OMG. You deserve it. #numberonefangirl" and "This is the most perfect thing ever to happen." and "There is magic in the world!!" Imagine winning a year's supply of something you love so much, it's part of your identity. Yes, magic — mixed with a little social media strong-arming. Like you, we had so many questions for Claire. How much is a year's supply? Is it all at her house now? Because it's free-flowing, will her love wane? Does she feel the blowback of fame? We invited her to the distillery so we could ask those burning questions, one-on-one. But there was something in it for her, too. Turns out, Claire hates only one flavor of LaCroix: coconut. She wondered: Could we help her change her mind by using it in a cocktail? Claire with her first of four shipments of La Croix. This one arrived at her office, much to the delight and confusion of her co-workers. Cardinal Spirits: First things first — how much is a year’s supply of LaCroix? Will it be enough to sustain you? Claire: They’re going to send me 100 cases throughout the year. My first shipment was a lot of 12-packs and a few of the skinny cans that have eight cans to a pack. It’s more than I drink now. I think people think I wake up and crush LaCroix all day. I have 1 to 2 cans a day, so a case is fine for a week. CS: How did you win? Claire: It was a Twitter contest — the 12 days of LaCroix or something like that — leading up to Christmas. So, I just retweeted it a bunch of times, saying if I won a year, I’d do this and that and dadadada… And then LaCroix tweeted back, on Christmas Eve, and said I was a grand prize winner. I was like, this can’t be real. And my dad was like, I’m sure you’re on some short list of super annoying people that hit them up all the time, and they were like, just give it to her. It’s true, it can’t be an accident. The Twitter exchange that made Claire a winner. CS: So, really, you don’t think you were a random winner? Claire: No, I don’t think so at all. That would be crazy. I’m the ideal candidate. I’m a meme of myself at this point. CS: This was a personal win, but really, you've been trying to get LaCroix to sponsor the Middle Coast Film Festival in Bloomington, which you help organize. You've been hounding LaCroix on social media for how long? Claire: For like a year, taking photos and Snapchats and tagging them. I love it, first of all, and I buy it all the time. I have a friend Jessica (another Middle Coast organizer), and you come to either of our houses, and we have a shelf full in our fridge — it’s like, pick your flavor. It just became a funny thing between us to take pictures with LaCroix. We wanted LaCroix to be a sponsor (of the Middle Coast Film Festival), to have cans for filmmakers and at the different venues. CS: Do you have a favorite flavor? Claire: This is hard. This is really hard. Because the ones I drink with a meal are different than the ones I put vodka in. The one I buy the most just to have around is peach-pear, and pamplemousse (French for grapefruit). Claire: I like the cherry-lime skinny cans. It seems like there’s more flavor in it, so it’s good with vodka. And then passion fruit is also really good. I pretty much (mix) with vodka, unless I do gin, and then I like the lime flavor. CS: And there’s just one flavor you dislike: coconut. What’s the deal? Claire: It tastes like sunscreen. I like coconut milk, coconut flakes. But I don’t like coconut-flavored things. This flavor is overpowering to me. CS: When did your obsession with LaCroix start? Claire: This is so lame - I know the origin story. It was when I first moved to Bloomington. I had a friend, this was three or four years ago, and I was at her house and she asked if I wanted water. I said yes, because I had just rode my bike. And she said, “Do you want just like a glass, or do you want sparkling?” And I was like, “Sparkling? Who are you?” She gave me a pamplemousse, and I thought, that’s super yummy. And now it’s part of my grocery list. CS: So after you won the contest, did a bunch of LaCroix show up at your house one day? Claire: I asked if they could not deliver all the LaCroix at once, because I live in a 1-bedroom apartment. That was fine, but I needed to sign for the delivery, so I told them they’d have to deliver it to me at work because I’m not home when FedEx comes. I’m a reporter, and I was out reporting the day it came. So I get all these videos on my phone of my coworkers unloading a pallet on the loading dock. They just stacked the cases up around my desk like a wall. It’s been a four-day process of trying to get it all on a dolly and to my car to take home. I don’t like the idea of clutter, but I’ll deal with it for the LaCroix. I left a few boxes under my desk at work and I gave a few away. But, it’s a lot. CS: Any other perks or fame that has come with your winnings? Claire: When I found out a won, I put a photo on Facebook and was like, 2016 is rough, but look what happened at the end. Follow your dreams. I was at a party a few weekends ago, and some random man walks up to me and says, “Are you Claire?” And I said, “Yes, have we met?” He says, “No, but we have a mutual friend and I saw your Facebook post. You’re the LaCroix chick?” I was like, I guess, yeah. It’s a small town. CS: With a nearly endless, free supply, do you think you’ll get sick of it? Claire: I don’t think so. They gave me such a good variety, especially the skinny cans that I don’t normally buy. The first cocktail was made with Cardinal Spirits Tiki Rum, mango puree, lime juice, cinnamon syrup, mint and coconut LaCroix, which Alex dubbed Tropical Contact High. “I can’t even taste the LaCroix!” Claire says after the first sip. They made a second cocktail with our Lake House Spiced Rum, carrot juice, lemon, ginger syrup and coconut LaCroix. In this one, Claire thought she could taste the coconut LaCroix a bit more. Whomp whomp. Cleverly named Copper Tone by a Facebook commenter, this cocktail is bright and fruity with a kick from cayenne ... and definitely no sunscreen aftertaste. Add all ingredients except for LaCroix to a shaker, then add ice. Shake well, then strain into a large rocks glass filled with ice. Top with Coconut LaCroix, then garnish with a lemon peel.